Follow this link to the Consumer and Business Services (CBS) website announcing this registration scheme. The Registration is required for anyone undertaking inspection and testing of fire systems that are or could be connected to domestic portable water supply from 1st April 2018. 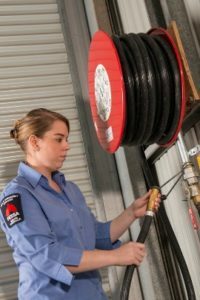 Fire hose reels will only be able to be inspected and tested by someone with the Fire Suppression Registration. People with the Registration will be able to conduct all functional testing of the hose reels. Fire Hydrant systems testing up to 6 monthly testing using the new standard AS1851:2012 can be conducted by someone with this Registration. The annual tests under AS1851:2012 can not be undertaken – this is a flow test of the system. Buildings approved before May 2015 that use this standard do not have a flow test of the hydrant system conducted year, it is every 3 years. We therefore believe that the people registered under this scheme can undertake the annual inspection of the hydrant systems. Sprinkler system weekly, monthly, quarterly and 6 monthly tests can be conducted by someone with this Registration. The annual flow test can only be conducted by a licensed Sprinkler Fitter. 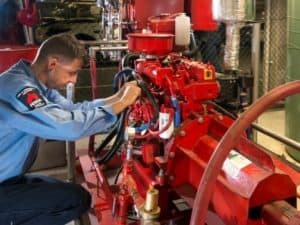 Fire pumps (electric and diesel) weekly, monthly, quarterly and 6 monthly tests can be conducted by someone with this Registration. 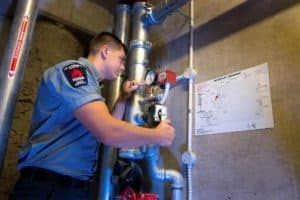 The annual flow test can only be conducted by a licensed Sprinkler Fitter. If you have a hose reel, hydrant system, sprinkler system or fire pump in a building you manage then you will need to take action! Firstly you will need to confirm that your service provider is Registered with the State Government under this scheme, if they are not then they are conducting unlicensed work. Your insurance, and their insurance will not cover work undertaken by unlicensed people. So if they are unlicensed you need to find an alternative provider urgently. Secondly, there may be some additional charges resulting from the requirement to use a registered sprinkler fitter or unrestricted plumber to complete some annual tests. Your maintenance provider should advise you of these changes. The registration is based on competency being achieved in a number of subjects. 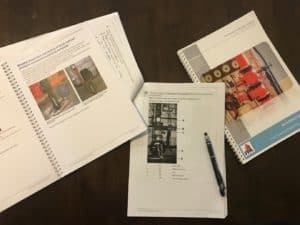 Many or our staff already have these competencies as part of the registration with the Fire Protection Accreditation Scheme (FPAS) administered by the Fire Protection Association (FPA) Australia. The rest of our staff are completing the training in March and early April. It could not be completed early due to the lack of availability of trainers. The majority of our staff have submitted their application for the license/registration. There may be changes to this scheme introduced in the future. The Registration was introduced without two way consultation with the industry. Since the original notification about this registration the FPA Australia and FESSA have been lobbying various Ministers of Parliament to have changes made to make it more practical and extend the introductory period from 6 months. This has resulted in some changes being made in January 2018. We expect more changes may occur as CBS better understands how difficult it is for staff to obtain the required competencies within the limited time frame they have proposed.